Tournament it’s exciting but still simple and easy to join in! 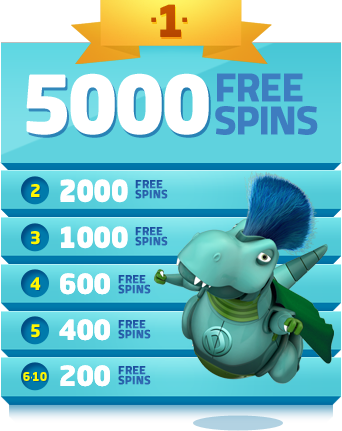 LuckyDino will give 2 Free Spins to every player. Everyone who wins something with those Spins will continue to the next day’s competition. Players get again 2 Spins and winners continue on the next day. When 30 players or less are left in the Dinoment, we will have the Grand Finale. All players will get 5 Free Spins and the top10 will get prizes. Results are based on the total win with the 5 Free Spins. Just make a deposit before Monday the 9th and you are in! Remember that on top of Dinoment you get a 100% Bonus and 50 Free Spins on Big Bang with your initial deposit. 1. Register your LuckyDino account from here. 2. Go and play your 7 free spins on ‘Lights’ and scratch free ‘Lucky Double’ cards(FIN, SWE, GER, UK& Australia). 4. Day after the deposit, find 50 ‘Big Bang’ free spins and get ready for Dinoment! Note! Tournament is finished already!